(CN) – A dramatic downsizing of national monuments took effect on Friday, coinciding with Trump administration announcements about increasing energy development on public lands that drew heavy rebuke from environmentalists. Two executive orders President Donald Trump signed in December reduced Bears Ears National Monument in Utah to 14 percent of the area designated by former president Barack Obama in 2015, and nearly halved the size of the Grand Staircase-Escalante National Monument. Grand Staircase, also in Utah, was designated by Bill Clinton in 1996. The reductions drew fierce criticism from environmental organizations, Native American tribes living in proximity to the monuments and recreation advocates who claim the true motive behind the downsizing is extraction of publicly held natural resources. Meanwhile, the Trump administration further ramped up its efforts to enhance energy production on public lands by unveiling a policy aimed at expediting oil and gas leases and revisiting a conservation plan that guided renewable energy development in California’s Mojave Desert. In Utah, where federal ownership of public lands has long been opposed by the state’s congressional delegation, Trump said the nearly 2 million-acre reduction of the national monuments was necessary to restore state and local control. The decision “was made in the interest of giving the land back to the people of Utah,” he said during a December speech in Utah. But environmentalists say public lands belong to all of Americans, not just the people of Utah, and the administration’s supposed concern for the monuments’ neighbors disguises its true purpose – accommodating the mining and drilling industries. Uranium deposits in what used to be Bears Ears are now available to be mined, while Grand Staircase border reductions opened up several coal deposits for potential extraction. “It was a uranium company that lobbied the Trump administration to exclude potentially ore-rich areas from the new Bears Ears boundaries,” the Wilderness Society said in a statement Friday. Energy Fuels Resources (USA) Inc. lobbied the federal government to exclude certain uranium rich portions of Bears Ears, but has said recently the current price of uranium makes opening a mine in the area cost prohibitive. 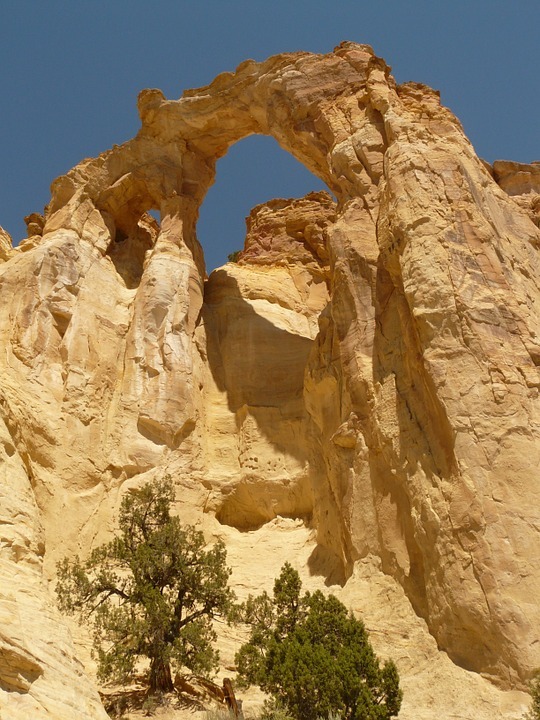 Grosvenor Arch in the Grand Staircase-Escalante National Monument. Conservationists say price points fluctuate and extraction technologies improve, meaning the lack of interest on behalf of energy companies could be temporary. With that in mind, the Wilderness Society, other environmental organizations, Patagonia clothing company and several Native American tribes have filed a total of five lawsuits claiming Trump overstepped his authority in carrying out the monument reductions. They say the areas should be left untouched for tribes, wildlife and recreation. “This unbalanced approach is especially worrisome in the current pro-fossil fuel political climate, with oil, gas, coal and other interests flexing their muscles like never before in the White House and Congress,” the Wilderness Society said. Changes to the national monument coincide with the release of Bureau of Land Management memo on Thursday that seeks to speed up and streamline permitting for oil and gas leases on federal lands. Under the new policy, the BLM would make leasing decision within 6 months, remove mandatory public input and instead give BLM managers discretion to significantly shorten public comment periods. Several public lands advocates castigated the policy, saying not only is it an assault on the environment, but will be counterproductive in achieving their stated aims. Finally, Democratic lawmakers are taking issue with the Trump administration’s efforts to revisit a hard-won conservation plan regarding the Mojave Desert that strikes a balance between allowing large-scale renewable energy projects and preserving fragile landscapes and ecosystems. Senator Dianne Feinstein, D-Calif., who has worked on several Mojave Desert preservation projects including the designation of Joshua Tree and Death Valley national parks, criticized the administration on Thursday. “The Desert Renewable Energy Conservation Plan was developed in 2016 as a way to both preserve desert ecosystems and allow for the development of renewable energy projects,” Feinstein said. “It’s a balanced plan that resulted from years of careful analysis and wide-ranging community engagement. I question the logic of reopening this carefully-crafted compromise that was so recently settled. The Bureau of Land Management said it needs to revisit the plan to make sure it complies with Trump’s executive order to increase energy development on public lands.